Dr. Mclaughlin is an Atlanta native, receiving his undergraduate degree from Duke University. He attended medical school at the Medical College of Georgia and completed his radiation oncology residency at the Shands Cancer Center at the University of Florida. He has been on the faculty at the Mayo Clinic and Wake Forest University , and he has practiced at St. Joseph's Medical Center and Barrow Neurological Institute in Phoenix, Arizona. In 2004, Dr. Mclaughlin joined North Georgia Radiation Therapy. He has lectured nationally and internationally on his primary interests of brain, breast, prostate, and gynecological malignancies, and has published several articles and book chapters on oncology topics. Dr. Mclaughlin has extensive experience in intensity modulated radiation therapy (IMRT), radiosurgery for brain and spine tumors, and brachytherapy, including high-dose rate (HDR) radiation therapy. Dr. Mclaughlin is an Atlanta native, receiving his undergraduate degree from Duke University. He attended medical school at the Medical College of Georgia and completed his radiation oncology residency at the Shands Cancer Center at the University of Florida. He has been on the faculty at the Mayo Clinic and Wake Forest University, and he has practiced at St. Joseph's Medical Center and Barrow Neurological Institute in Phoenix, Arizona. 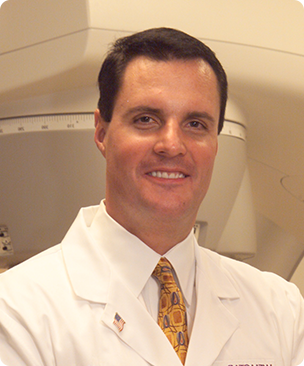 In 2004, Dr. Mclaughlin joined North Georgia Radiation Therapy.